Makes all metals looks better! 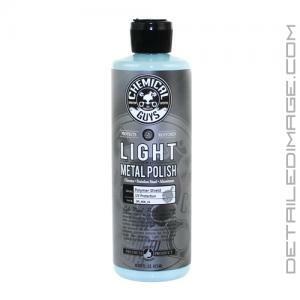 Clean and protect your metal surfaces with Chemical Guys Light Metal Polish in one easy step! This polish deep cleans the surface removing embedded contaminants so you get that deep shine back. It'll easily remove brake dust, road grime, light oxidation, dirt, pollen, light rust stains, water marks, etc. At the same time this innovative formula leaves behind durable protection that resists dirt, debris, contamination, light oxidation and stains for the ultimate shine. Use it on chrome, stainless steel, aluminum, copper and clear coated metal surfaces protecting them from harmful elements. Advanced polymers were specifically formulated to provide the highest level of protection while also leaving a crystal clear finish. It makes maintaining your wheels easier and it withstands some of nature's harshest elements. After one application rain and moisture will roll off with ease and your wheels stays looking great for longer. To apply just pour a nickel sized drop on a clean applicator or microfiber towel and hand apply it to the wheels with light to medium pressure. When you are done with applying it take a clean microfiber towel and buff away the excess product with ease. The Chemical Guy Light Metal Polish will clean and protect virtually any metal surface your vehicle has so it looks amazing! Chemical Guys Metal Polish is a product we have been using for years. It has always produced excellent results for us, and a single bottle will get me through a couple of years of exhaust tip cleaning! Light Metal Polish is a unique coating designed to protect the shine of your metalwork. The innovative formula resists dirt, debris, contamination, oxidation and stains for the ultimate high gloss shine. Light Metal Polish is perfect for protecting chrome, stainless steel, aluminum, copper and clear coated metal surfaces. Advanced polymers provide the highest level of protection from the elements for a crystal clear finish. Light Metal Polish is nonabrasive and completely safe for wheels, bumpers, exhaust tips, diamond plate and precious metalwork. Our state-of-the-art metal protecting formula combines natural carnauba and synthetic polymers to enhance shine. Coating technology repels water for a reflective finish. Create a mirror shine on all polished metals, Light Metal Polish provides a high gloss shine with durable protection.